Early birds staking their (rather precarious) pitches . Much of the road up the pass had signs saying "No Spectators" I think because it was rather steep hillside and the organisers feared falls and accidents. So some of the best viewing positions involved climbing over walls and a bit of trespass. People were keen to get good views, so kept going were they weren't supposed to go. There was a constant game of cat and mouse between the spectators and marshals in the hours leading up to the riders arriving. The spectators who have avoided the mars halls get the best views. Mike has been web designing, programming and building web applications in Leeds for many years. He founded Onsitenow in 2009 and has been helping clients turn business ideas into on-line reality ever since. Mike can be followed on Twitter and has a profile on Google+. 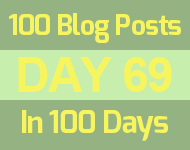 This is an experiment to see what effect posting a blog post every day for 100 days will have on this website's Google ranking. If you would like to receive a full search engine optimisation (SEO) report on the results of this experiment and the techniques I used at the end of 100 days then then tough, there is not one.